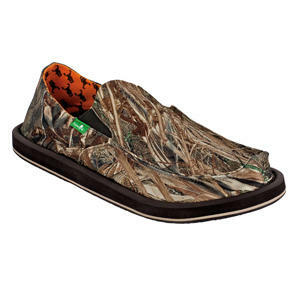 The venerable, Irvine-based flip-flop company's joined forces with a hunting-gear brand for a trio of camo'd footwear: the thong-style "Roots," the slip-on "Vagabond", and the "Fault Line," with a green-and-brown top, and a footbed made from a yoga mat, so you know you'll look good rolling up in them. Warrior Pose!! © 2019 Group Nine Media Inc.
Like us on Facebook to get the best of both worlds. We see that you already have an account. There was an error signing up. Try again. The best decision you'll make all day. You already have an account! There was an error, try again. The very best food, drink, and fun from across the country and around the world delivered piping hot right to your inbox. Eat up! Type in your zip code and we will find you the freshest, local recommendations. Sorry, there was an error processing your information. Please try again. You are 21+ years old.